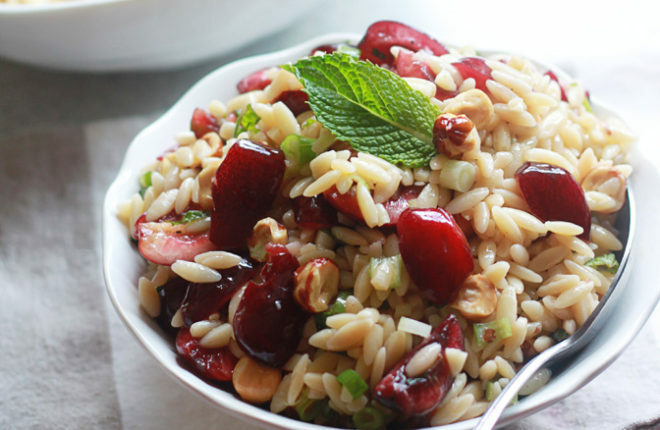 Tender al dente orzo pasta, sweet summer cherries, and crunchy hazelnuts make for a scrumptious seasonal salad. Perfect picnic or potluck dish, and easy to make ahead of time. Okay, so I know Friday’s post about how to pit a cherry without a pitter was a little random. Well, except for the fact that it’s cherry season right now. And so you needed to know! 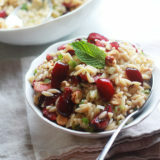 Especially because now I’ve got a tasty orzo salad recipe to share, and the highlight of this delicious dish? That’s right – fresh cherries. Pitted ones, of course. Last week, we received our first CSA box of the season. And it was a doozy! I plopped my little one on the kitchen counter and we pulled produce out of the box. Like a clown car, the fruits and veggies just kept coming. Oh, and allow me to brag for a moment: my toddler knew the names of most of them! “That’s asparagus!” So cute. Now if she’d just eat some. 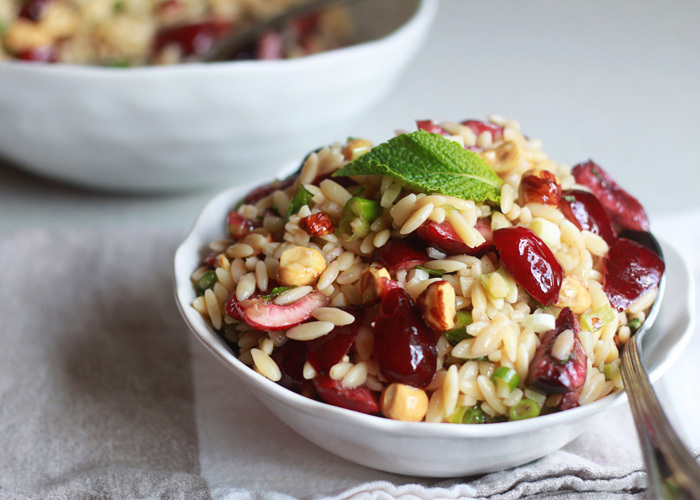 I’ve been wanting to come up with a new orzo salad (oh how I love this one), and as I pulled the cherries out of the box, I thought that fresh cherries might just be the inspiration ingredient I was waiting for. So I cooked up some orzo, pitted my cherries, chopped some toasted hazelnuts, fresh mint, and scallions, and mixed it all together with a fresh honey-hazelnut vinaigrette. 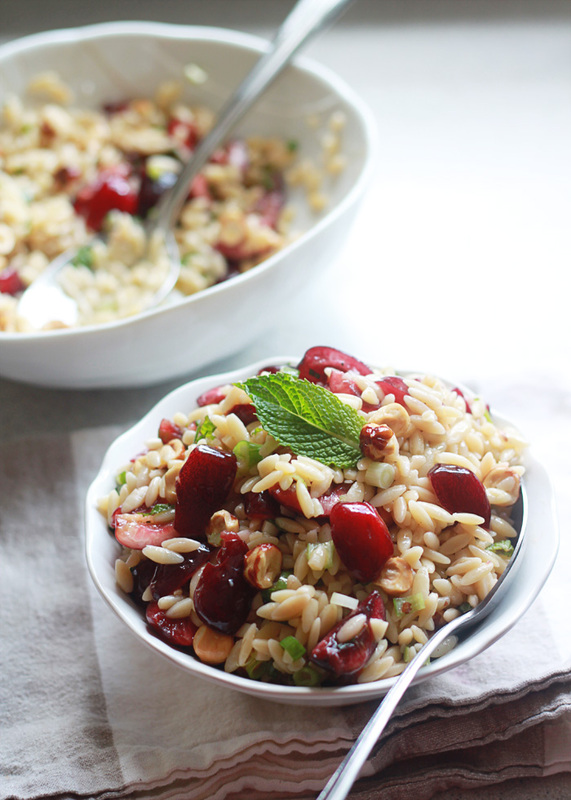 Cherry Hazelnut Orzo Salad was born – and that old favorite has been cast aside. Okay, not really. My heart has doubled in size – I now love both orzo salads at the same time. I love the toasty crunch of the hazelnuts, and the light hazelnutty flavor that just a touch of hazelnut oil imparts. The cherries add a nice, juicy sweet bite, and the scallions and mint add a fresh zestiness. “Fresh Zestiness” – that should be a band name. This is one of those salads that tastes even better after it’s hung out for a while, so if you’re planning to bring it to a picnic or barbecue, that’s a total bonus. Just make it the day before and you won’t have to scramble the day-of. And your orzo salad will be even more delicious. In our house, this salad will be an excellent addition to our “substantial sides” repertoire. It makes a terrific main dish for the vegetarian (moi), while it can act as a side for the carnivores. Add 2 teaspoons kosher salt to a large pot of water and bring to a boil over high heat. Add orzo and boil until al dente according to your package directions (about 9 minutes for mine). Drain and toss with 2 teaspoons olive oil to help prevent sticking. Set aside to cool. Once cool, pour orzo into a large bowl. Add cherries, hazelnuts, scallions, and mint. Toss gently to combine. Add all vinaigrette ingredients to a small bowl and whisk together until smooth. Pour over salad. Stir until salad is coated with the dressing. Taste and add additional salt and pepper, if desired. Refrigerate sealed until ready to serve. Keeps refrigerated up to three days; if you prefer very crunchy hazelnuts, you may want to wait and add them right before serving. If you have raw hazelnuts, you can easily toast them yourself. Just spread them on a rimmed baking sheet and place in a 350 degrees Fahrenheit oven for about 10 minutes, until fragrant, lighty colored, and blistered. Remove from oven, let cool, and rub skins off by rolling in a clean kitchen towel. This salad is just gorgeous, Karen! I can’t wait to get my hands on a nice basket full of cherries! My first response was WHAT. Then, WHEN?! 🙂 My toddler also knows the names of many of the foods … that he won’t eat. However … he loves orzo! This looks amazing!! 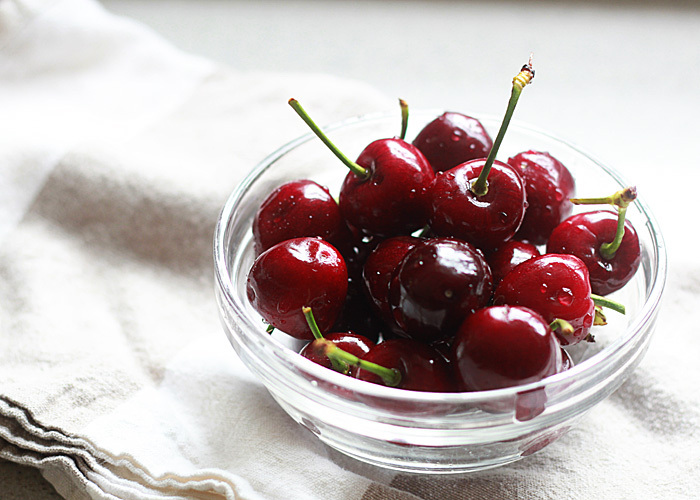 Love the cherries in here…so yummy, and they’re in season! Thank you Rachel! I am gaga for cherries right now … nothing better! This dish is so bright and perfect for summer. Gorgeous photos! Thank you so much, Abbie – and thanks for the pin! I want to try this, but I do not have hazelnut oil. Can I just use olive oil? Or Canola oil? Hi Lisa, I think sesame oil might be a nice sub if you have it, otherwise, just a little more olive oil and you should still have a perfectly tasty salad. Made this recipe today to take on a picnic later. Love the taste, very fresh and light. thanks for the post. Can other types of pasta be used like penne or mini farfalle?